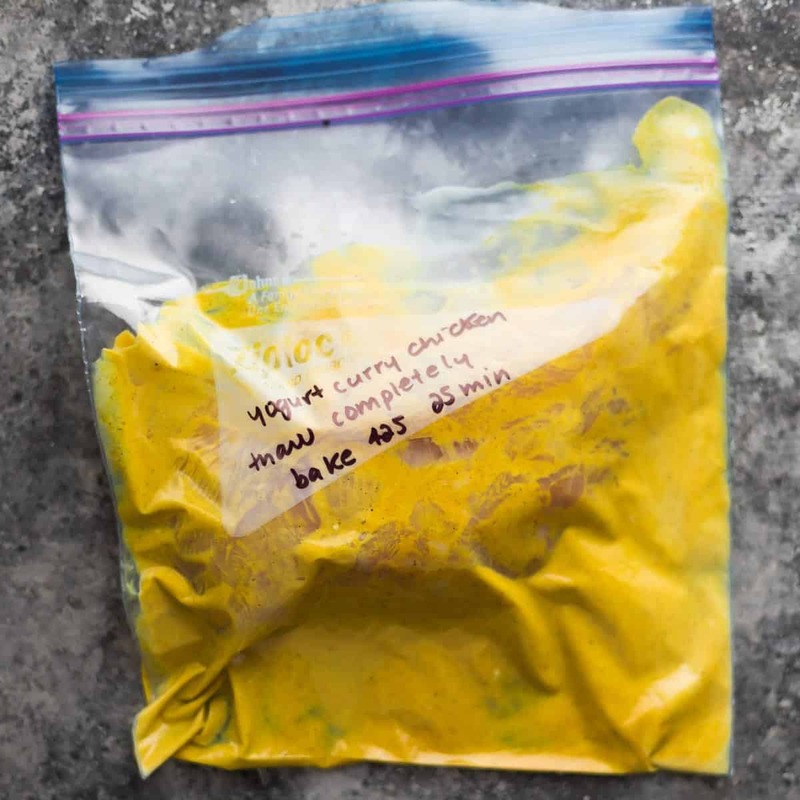 7 chicken marinade recipes you can freeze. 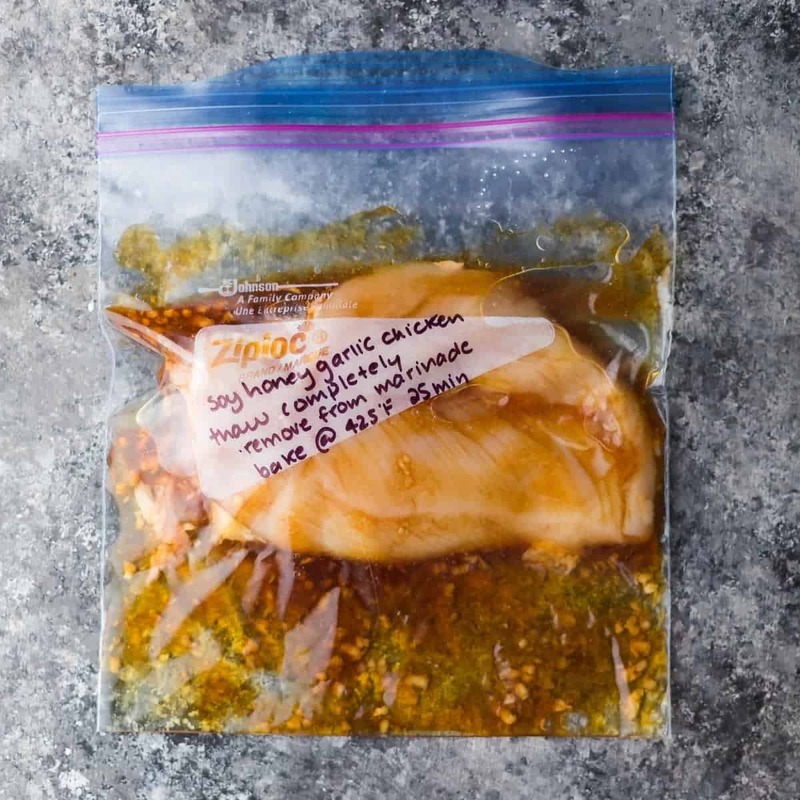 This post shows you exactly how to marinate chicken breasts to get the BEST flavor, and how to freeze them for easy convenient dinners. We’ve been stuck in a chicken routine lately, and I’m getting a little sick of the same old flavors…so to shake things up, I’m sharing 7 chicken marinade recipes! NEW: Head over here for 7 Instant Pot Chicken Breast Recipes! And check out these 7 Slow Cooker Chicken Recipes! Click here to download a free printable with all seven chicken marinades! NEW: Find 7 MORE Freezer Chicken Marinades here!
. 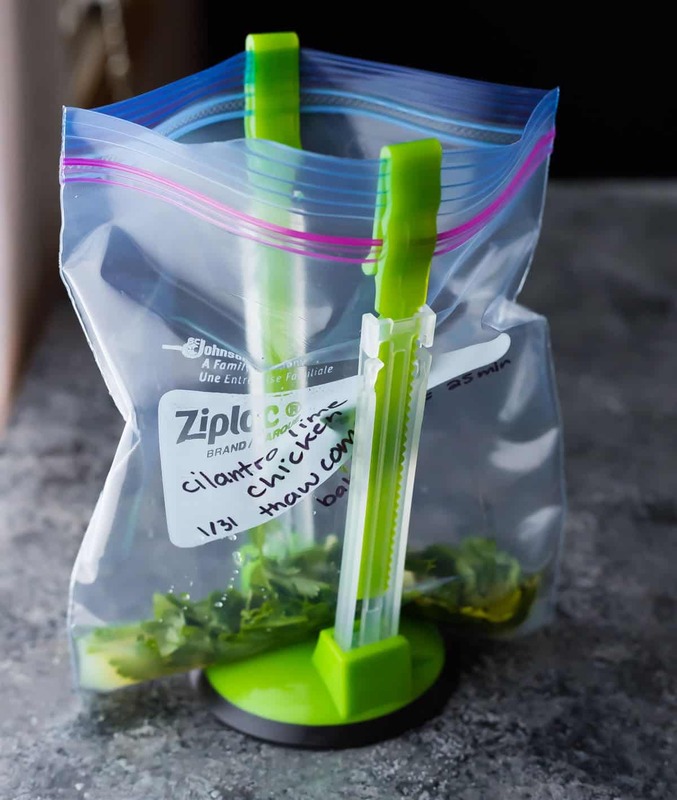 I am constantly looking for ways to reduce my kitchen waste, but I haven’t found a suitable alternative to freezer bags when it comes to marinades. Glass containers require substantially more marinade to coat the meat.
! They are totally unnecessary, but also totally fun. They make it a bit easier to get the chicken into the bags without getting raw chicken all over the seal. 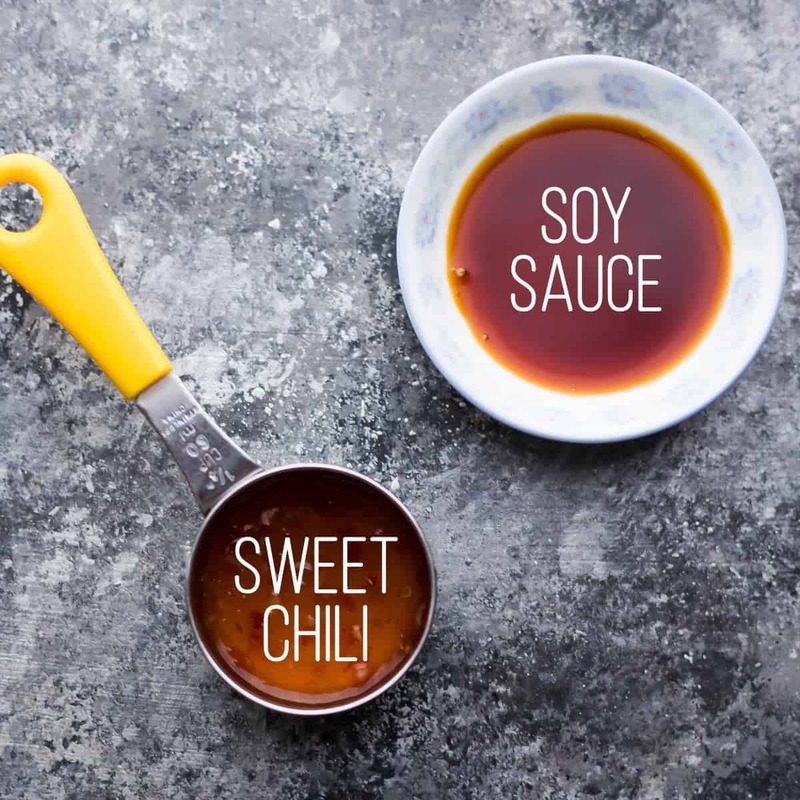 Marinating ‘rules’: OK, I’ve read up on chicken marinades quite a bit this month and there is quite a bit of contradictory advice out there. 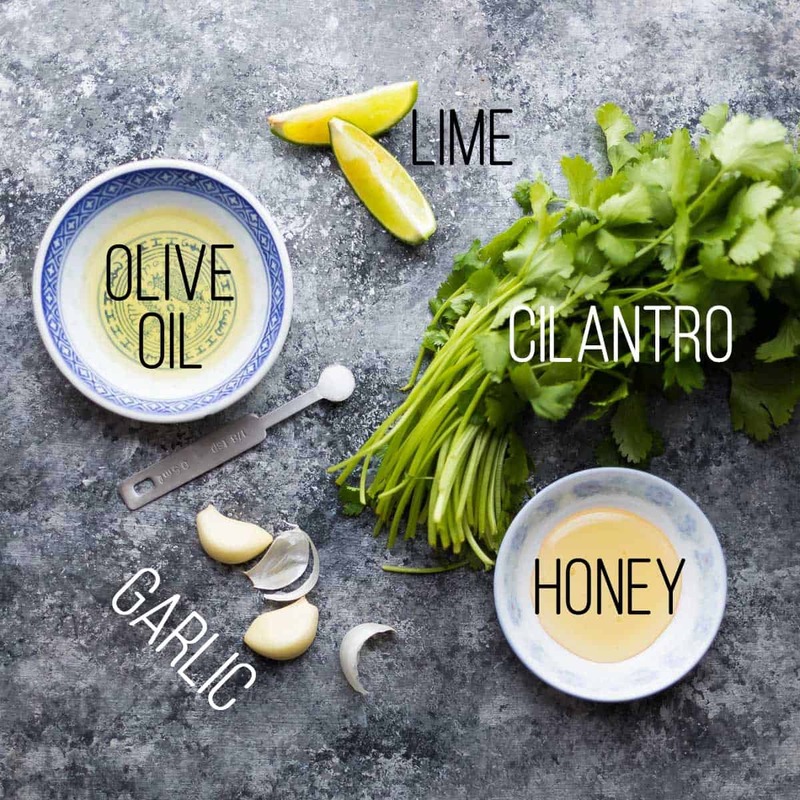 Some people say that marinating in citrus or acid-based marinades leads to mealy chicken but that was not the case for any of these marinades (possibly because they are balanced with oils and other ingredients). How long can these be frozen? Up to 3 months. As everything freezes, the marinating process stops, and starts up again as the chicken thaws. What if my chicken is already frozen? Do not thaw your chicken if you are going to freeze again. 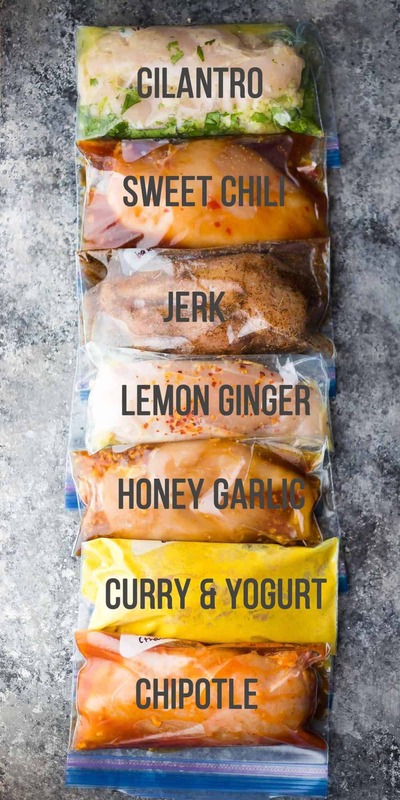 Add the marinades to already frozen chicken, and you will still get a ton of flavor from marinating while it thaws. How to thaw the chicken? The safest bet is in the fridge overnight, but you can do a rapid-thaw process in cold water for a few hours. Just make sure your freezer bag is heavy duty so you don’t have any leakage! Can these marinades be used on other types of meat? Probably but I’ve only tested with chicken. 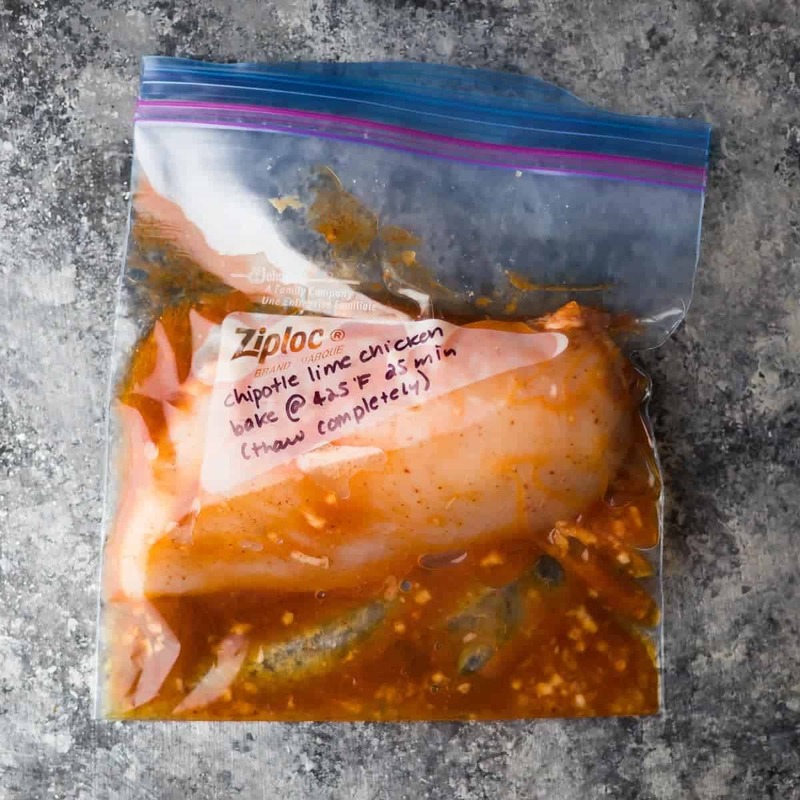 I would not freeze fish in these marinades but they may be good for a quick 30 minute marinade. Can I grill or pan-fry the chicken? I have only tested these recipes in the oven but they should be transferable to the grill and frying pan. You may wish to shake off excess marinade prior to grilling to prevent flare-ups and/or brush more marinade on while grilling for extra flavor. One more thing- don’t forget to let your chicken rest after you bake it. Resting 5-10 minutes at room temperature before slicing will help seal in the juices. 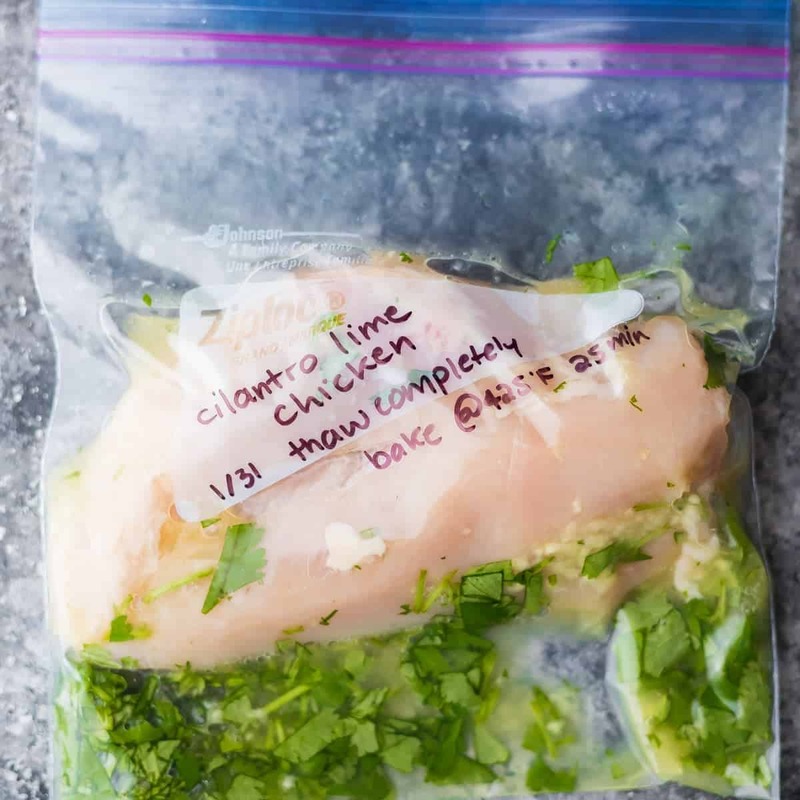 GRAB THE CILANTRO LIME CHICKEN MARINADE RECIPE HERE! GRAB THE SWEET CHILI CHICKEN MARINADE RECIPE HERE! 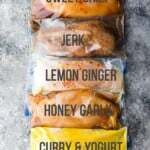 GRAB THE PRINTABLE JERK CHICKEN MARINADE RECIPE HERE. 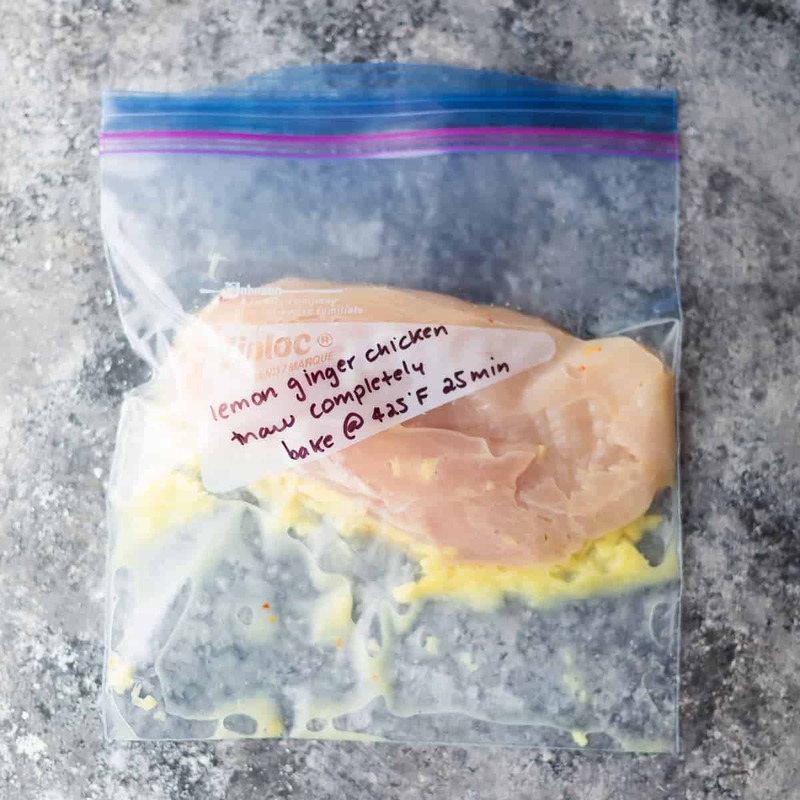 GRAB THE PRINTABLE LEMON GINGER CHICKEN MARINADE RECIPE HERE. 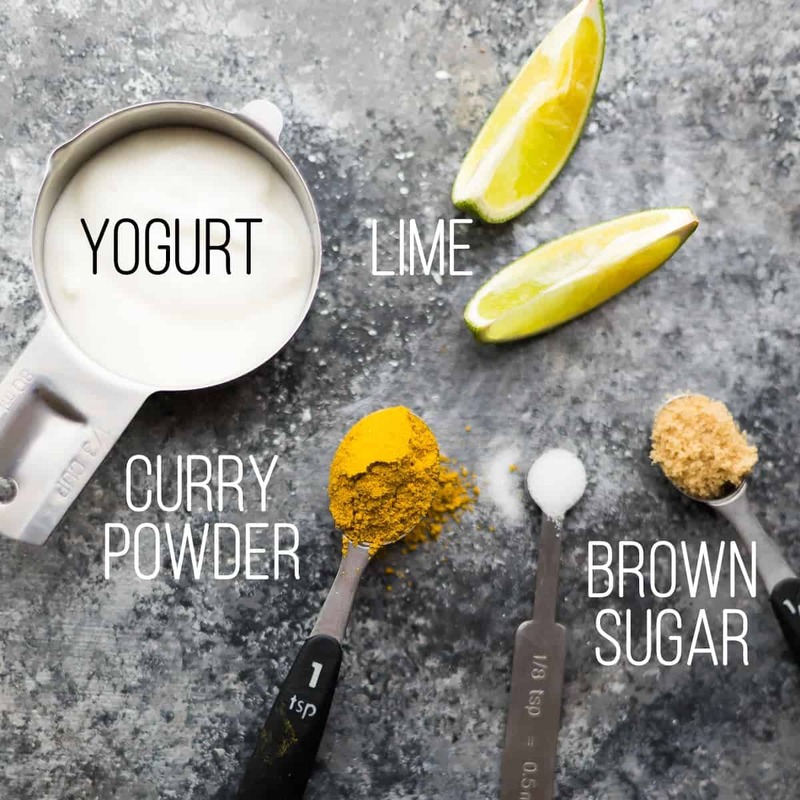 So…I was on the fence about whether I should post this recipe or not, because the fact is: yogurt is not freezer friendly. As the yogurt thaws, it breaks and becomes flaky. HOWEVER. This chicken ended up so incredibly flavorful, and we weren’t bothered in the slightest by the appearance of the yogurt. The fact is, the yogurt gave so much flavor the the chicken that I had to include this recipe. 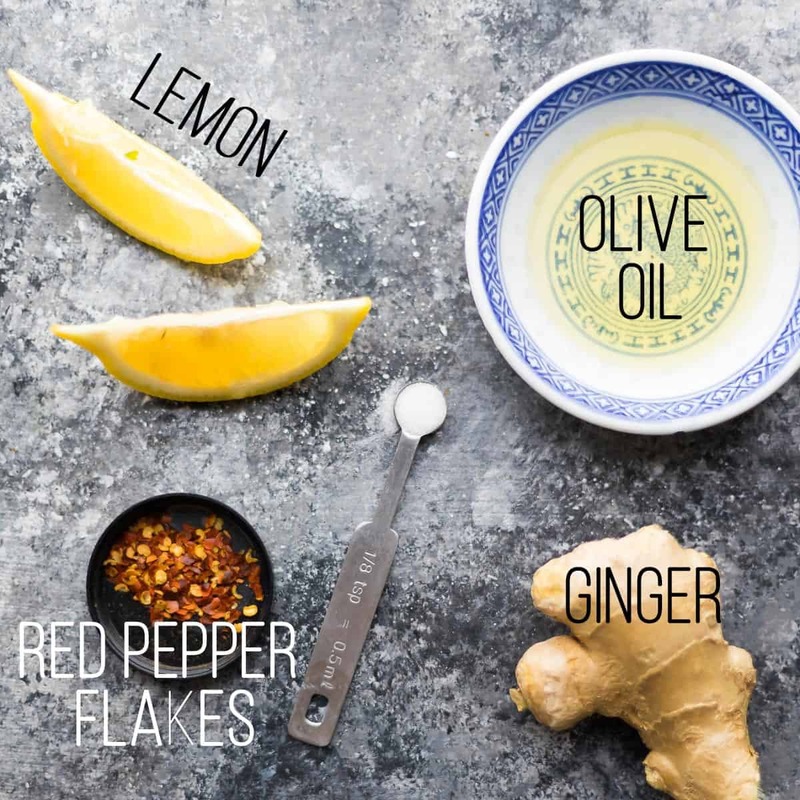 If it bothers you, keep this one in your pocket as a great short-term (fridge-friendly) marinade. 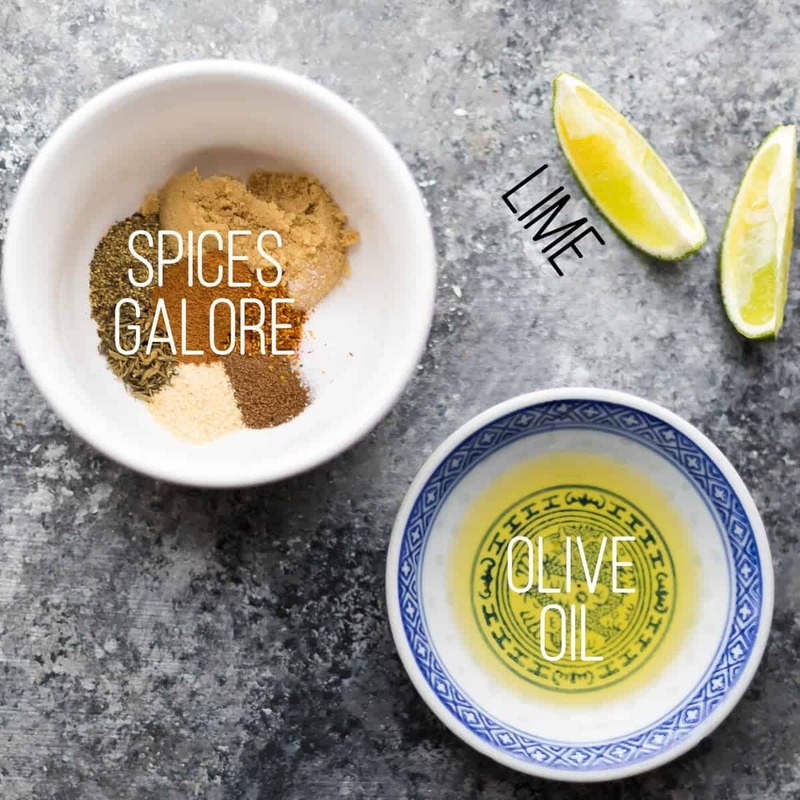 GRAB THE PRINTABLE CHIPOTLE LIME CHICKEN MARINADE RECIPE HERE! 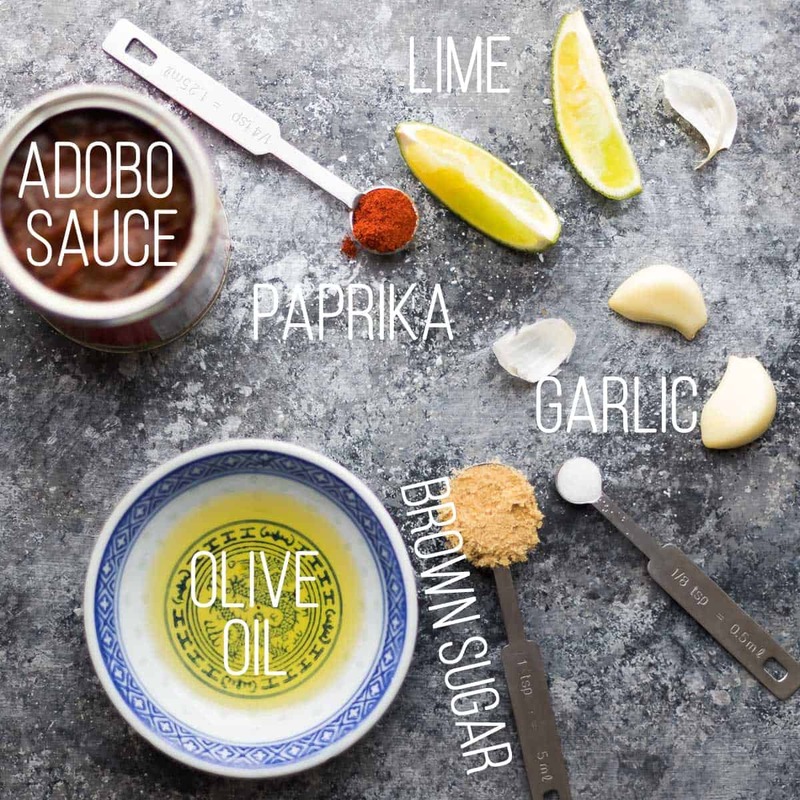 Last but not least…this chipotle lime chicken marinade is a great blend of sweet, spicy, smoky and savory. Add a chopped chipotle pepper for a real spicy kick! This chicken goes great with all things Mexican. Looking for easy meal ideas? * marinade recipes are for 1 large chicken breast (7 oz); double the recipe for 1 lb chicken breast and to serve 4! 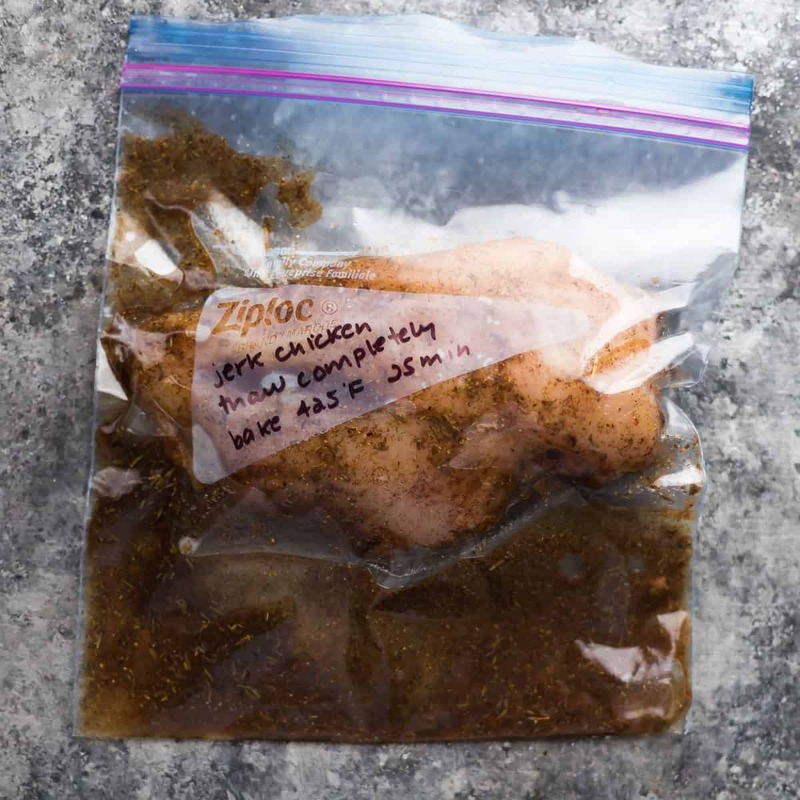 Combine all ingredients in a heavy duty freezer bag. Add chicken breasts and turn to coat in marinade. If I were to use bone in chicken pieces, how long should it be baked for? Hi! I haven’t actually tried that. This recipe calls for 35-45 min at 425. I would start checking at 35 minutes and check the internal temp! Can I cut up the chicken then marinate in the freezer, would the cooking times change? Hi Tegan! That should work just fine, but the cook time would be different. I would try 12-15 minutes. I love this. I have been cooking them in the air fryer. I just bought an instant pot and was wondering how the recipe change for it. I tried this, it was amazing. LOVE this idea, can’t wait to try! Question: do you think it’s safe to add frozen vegetables to the chicken bag? I’m thinking big chunks of cauliflower or broccoli. They’d defrost with the chicken and of course get the chicken juices over them…but if I bake them in the oven with the chicken, do you think it would be hygienic to eat…? Hi Jess! They’d absolutely be safe to eat, since the heat kills any bacteria the same way it does on the chicken. I’m not sure if they would cook for the same amount of time as the chicken, though? Frozen veggies cook through quite quickly since they are cooked before freezing. You could try cutting the chicken into bite-sized chunks and baking for just 15 minutes? Hi Denise! When cooking the chicken, do we dump all of the marinade into a baking dish and cook it with the chicken for the recommended time? Where can you buy these mariaids. I tried the honey garlic marinade. It was easy to assemble and tasted great. Next time I will season with salt and pepper to cut the sweetness a little bit. Glad you enjoyed, Erin! Thanks so much for your feedback! 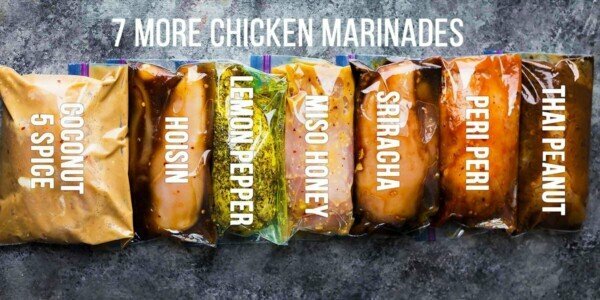 how long do these marinades last for if i wanted to make a lot at one time and use it over time? Hi David! These marinades will keep in the fridge for about 4 days. You can freeze them, but it’s against food safety guidelines to freeze food more than once, so I’m not sure how you’d go about that, unless you portioned it out. I made a set of these to put in the freezer. So far I have made the yogurt curry and the jerk chicken. Tomorrow night I am making the lemon ginger chicken and I have very high expectations for it as well!! Thank you! I hope you enjoy them all, Jodi! All your marinades sound delicious! When you bake the chicken in the oven, do you also add the sauce the chicken has been marinading in or do you need to discard the extra marinade? I was concerned about food safety. Thanks so much! I love your website!!! 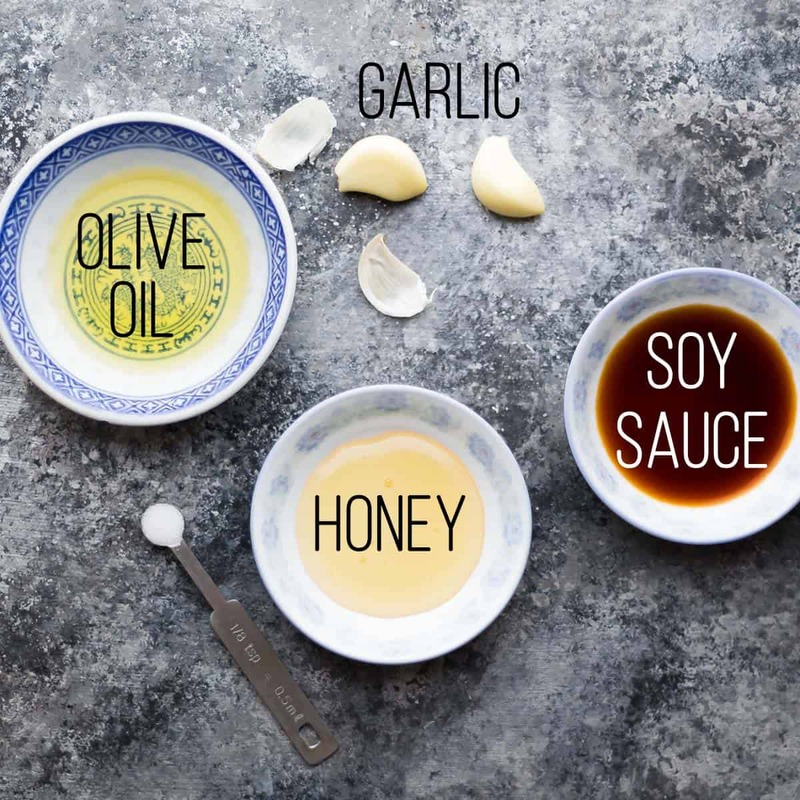 I have tried your chicken marinades for the instant pot that turn into a sauce and they are amazing!!! Hi Deb! For these recipes the marinade cooks along with the chicken. If you are heating/cooking the sauce through, it will prevent any issues of food safety, same way it does when you cook the chicken through. 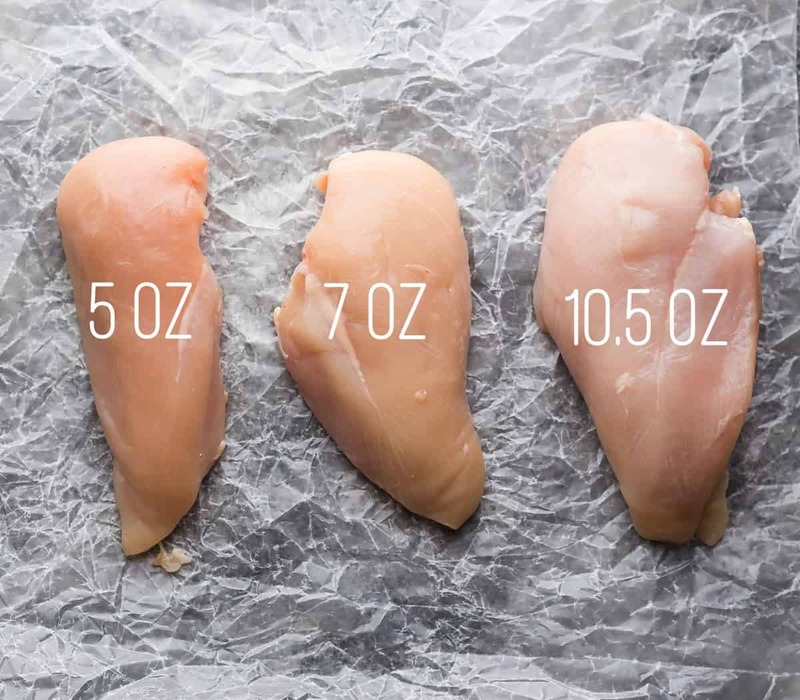 Can you use other types of chicken besides a chicken breast? Is there any precautions when making these with a different cut of meat? 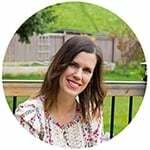 Can i use apple cider vinegar instead lime juice? Hi Katherine, I haven’t tried this. Which recipe are you thinking of trying? Question 1: Is the sugar necessary in the marinades. I am trying to live sugar free/saccharin, splenda, free too. Q2: Is there a substitute for soy. I need to stay away from peanut and tree nuts and many soy’s are in a facility that is uses nuts or has it in them. Hi Kim! 1. The sugar really balances out the savory/sour/spicy flavors. I have a feeling that if you are used to no sugar in your recipes, you probably wouldn’t miss it! If you do try, I’d love to hear how it goes! 2. Hmm that’s tough, because I guess coconut aminos would be out of the question? And tamari is also soy based, right? Let me think on this and hopefully someone can chime in and help! 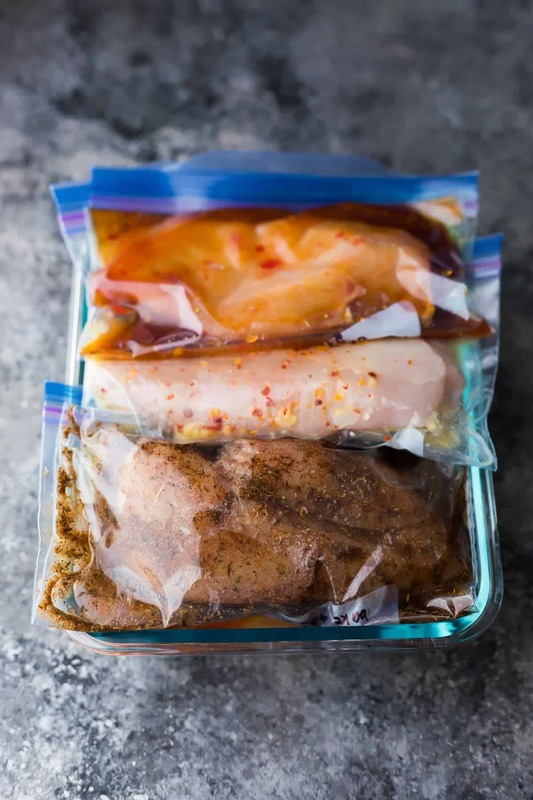 Since you are baking your chicken, you could dice the breasts up into cubes, put them in a freezer safe container, and pour your marinades over them. It should require roughly the same amount of marinade while giving the chicken a greater marinade to chicken ratio! HI Denise, have you heard of or tried Stasher bags? I have, actually I own a couple! They are not bad, I do like them but find them too pricy. 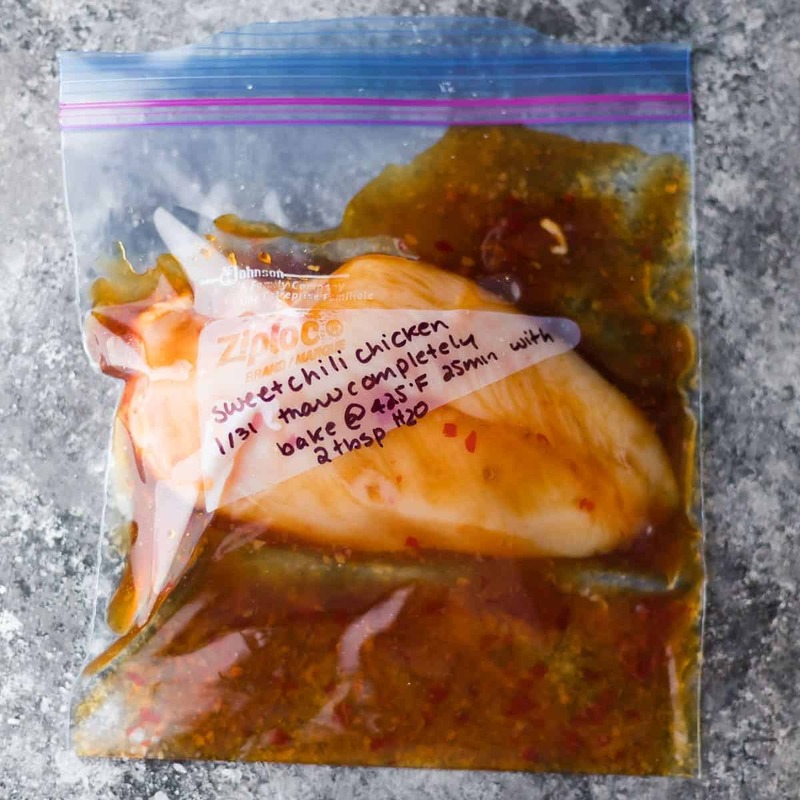 I have recently discovered some other silicone freezer bags that I’m testing out for freezing chicken in marinades. I plan to update this post with the info soon! Hey Denise, are there other reusable bags that you suggest other than Stasher bags? Hello! I´m looking to buy this reusable silicone bags. There are bags for 1,00o mL and 1,500 mL… The link you posted is for the 1,000 mL… this is the correct size right? Hi Veronica! I have purchased both the 1000 and 1500 mL and I don’t recommend the larger ones (at least the ones I purchased), because the lids are impossible to get on! I would use the 1000mL for these marinades, you should be able to fit 2-4 chicken breasts in each one. I love mine so much! Thank you so much for sharing this post, I been trying to find this on YouTube for a week and baam it’s in my email.